Take a pan and heat 2 teaspoon of butter. Add corn kernels, grated carrot, potatoes, capsicum, green chillies, pepper, salt and saute it for 4-5 minutes, till it is almost done. Take non stick tawa/skillet and heat it. Add 1 teaspoon of butter and cook tortillas on both the sides just for few seconds. 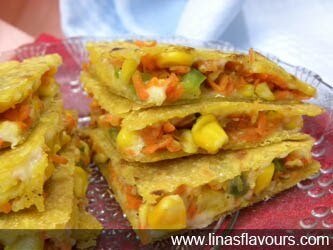 Spread only on half of the tortilla - some cheese, 2 teaspoon corn-carrot mixture, topping it up again with cheese and cover it up with the remaining half of it, shaping it up like a half moon. Cook on both the sides till cheese melts. Other way is cook two tortillas - spread the mixture on one tortilla, covering it with other and then cook it on both the sides. Cut into wedges and serve it immediately with tomato ketchup or any cold drink. I have stuffed the filling of corn-carrots. You can have your own choice of stuffing, be as creative as you want.